A paper in press at Human Molecular Genetics (Lahola-Chomiak et al., https://www.ncbi.nlm.nih.gov/pubmed/30561643) reports the results of a collaboration led by Dr. Michael Walter, and involving the Lehmann and Allison labs. This work discovered the first causative gene for pigmentary glaucoma, a common subtype of glaucoma, which represents the leading cause of irreversible blindness worldwide. 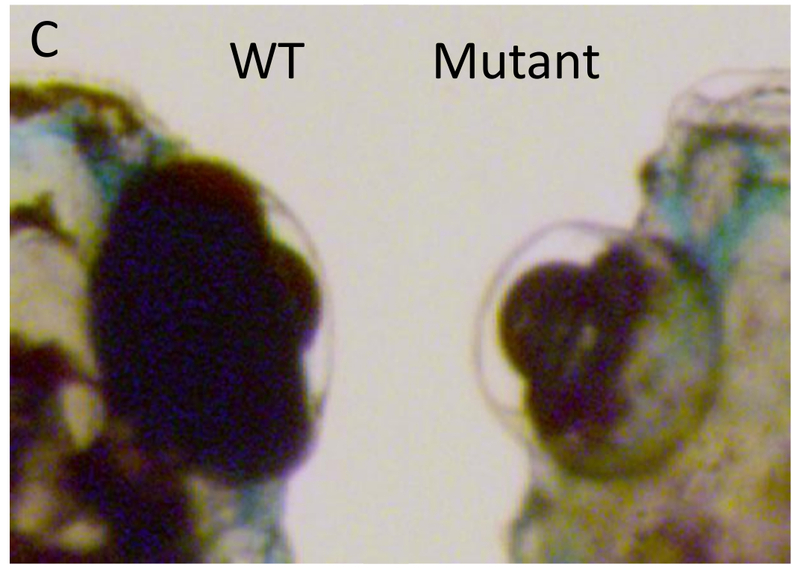 Dr. Walter’s team first identified a mutation in the premelanosome (PMEL) gene in DNA samples from two Mennonite cousins before identifying additional PMEL mutations in a cohort of patients with pigmentary glaucoma. Molecular analyses demonstrate that these mutations alter the function of the PMEL protein, and CRISPR-CAS9 mutagenesis of pmel in zebrafish resulted in both pigment defects and glaucoma-like phenotypes. In parallel, colleagues at Harvard and the University of Flinders (Drs. Wiggs and Craig), identified PMEL mutations in additional pigmentary glaucoma cases, strongly supporting the role of PMEL mutations in PG. Overall, these results improve understanding of the etiology of a major form of blindness, with opportunities for novel approaches for diagnosing and eventually treating this common form of glaucoma. Figure 1. 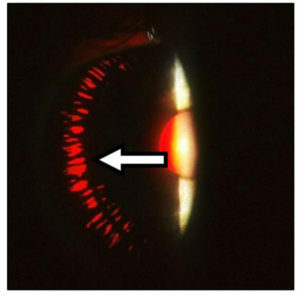 Typical signs of pigmentary glaucoma (pigment granules on the corneal endothelium, heavy pigmentation of the trabecular meshwork, and iris trans-ilumination defects. Figure 2. pmel CRISPR-generated zebrafish mutant demonstrating globe enlargement (a feature of congenital glaucoma in infants). The BrightFocus Foundation has an upcoming grant competition for those conducting research on macular degeneration, with a Letter of Intent due June 26th. Alberta Vision Net is made possible by generous support from the University of Alberta Faculty of Medicine and Dentistry, and the Royal Alexandra Hospital Foundation.